Traveling to Delphi in the late 1950s, Jean Richer, professor of literature with a special interest in symbolism, wondered about the connection between Delphi, site of Apollo's main sanctuary and oracle, and Delos, the god's traditional birthplace, as well as Delphi's relationship with Athena, so prominently represented at the sanctuary. Over several years Richer continued finding alignments by drawing lines on the map which formed geometric figures, many of which obviously represented projections or correspondences on earth of celestial objects and directions. In fact, "it quickly became clear that the Greeks, like the ancient Mesopotamians and the Egyptians, had wanted to make their country a living image of the heavens." Jean Richer soon became convinced that Greece had been divided into twelve sectors corresponding to the twelve signs of the zodiac, with Delphi as the center or omphalos, the "navel" of the Greek mainland. Examining art and artifacts from cities and temples in the pie-shaped sectors, Richer found that, far from containing arbitrary decorations, the images predominantly related to the seasons, solstices, cardinal points, and zodiacal signs corresponding to their particular sector of the Delphic "zodiac." Following Jean Richer’s passing away in 1992, his elder brother Lucien extended the ‘Apollo’ line passing through Delos, Delphi and Athens, to discover that it linked other ancient shrines including Skellig Michael in Ireland, St. Michael’s Mount in Cornwall, England, Mont St Michel in France, Sacra di San Michele in Italy, San Michele di Monte Gargano on the eastern coast of Italy, and Mt. Carmel in the Holy Land. Discussing this incredibly ancient and significant sacred geography. So while the Classical era Greeks did indeed erect stupendous temples at many sites throughout the mainland and the islands, the sites where those temples were placed had already been sacred sites of little known, but deeply knowledgeable, cultures which existed thousands of years before Greek times. Therefore it can be said with assurance, as was stated at the beginning of this essay, that the Classical Greeks were not so much creators of their sacred geography but rather inheritors of that system from an earlier people. Mt. 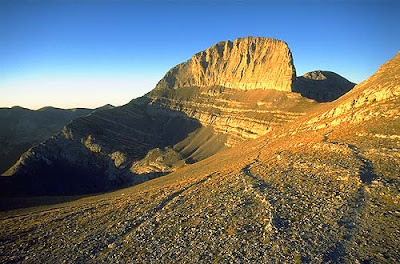 Olympus -Traditionally regarded as the heavenly abode of the Greek gods and the site of the throne of Zeus, Olympos seems to have originally existed as an idealized mountain that only later came to be associated with a specific peak.